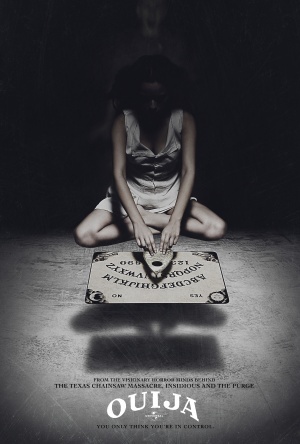 The whole concept of a Ouija board is that those who use it are unable to see the entities with whom they make contact. It’s basically texting from beyond the grave (Jason Reitman, take note). Considering this fact, especially when combined (bear with me) with Edmund Burke’s 1757 treatise A Philosophical Inquiry into the Origin of Our Ideas of the Sublime and Beautiful, a film revolving around a spirit board has the potential to become unique and compelling. Somewhat unsurprisingly, Ouija, brought to us in part by some of the individuals responsible for “The Purge,” “Texas Chainsaw Massacre,” “Paranormal Activity,” and “Insidious,” is neither of those things. Alright. Makes sense. Now let’s meet our characters. First we have Not-Ashley-Benson, Debbie (Shelley Hennig, “Teen Wolf” television series), a cheerful teenager whose suspicious suicide and subsequent parents’ recuperative trip open her house to her friends’ Ouija attempts to get in touch with her. Then there’s her best friend, Laine, or Not-Ariana-Grande (Olivia Cooke, “The Quiet Ones”); Laine’s sister Sarah, or Goth Sally Draper (Ana Coto, “DisCONNECTED”) and boyfriend Trevor (Daren Kagasoff, “The Secret Life of the American Teenager” TV series); Sad Jesse Eisenberg or Debbie’s boyfriend Pete (Douglas Smith, “Percy Jackson: Sea of Monsters”); and Naya Rivera/Mila Kunis lookalike Isabelle (Bianca A. Santos, “The Fosters” TV series). When Debbie and Laine are just little girls, Debbie, who displays a curiously extensive knowledge of how Ouija boards work, coerces a reluctant Laine to play with her. Years later, after Debbie is found hanging from the ceiling of her home by a string of Christmas lights that previously decorated her confusingly eclectic room (and none of her friends wear black to her funeral, which is weird), Laine finds a Ouija board in Debbie’s house and pushes her friends to indulge her in attempting to contact Debbie to find out how she died. Trevor plays the skeptical yet supportive boyfriend, Pete looks generally upset, Isabelle fulfills the necessary reluctant naysayer role, and Sarah gets dragged along because of the weird mothering dynamic between her and Laine that Cooke’s acting never quite pulls off. Almost immediately, the group makes contact with someone who they assume is Debbie. It’s not. From the moment they touch it, the planchette jerks around the board at breakneck speed. This is frustrating to anyone who has actually played with a Ouija board; the glacially paced yet consistent movements of the planchette are most of what constitutes its fun and fright. Flash forward to the board frantically spelling out “mother is coming,” the lights turning off, and several iPhone flashlights exploring the darkened house, rather than running away and never coming back. I am a huge horror movie buff. From “Pumpkinhead” to “The Collection,” I have paid my dues and become extremely familiar with the genre. My favorite thing to look for and analyze in any horror film is the devices that are employed to prevent potential victims from returning to safety. One of the most legitimate excuses I’ve seen in recent years (and I’m not necessarily saying this is a good thing) was the 2013 remake of “Evil Dead,” in which a group of friends explains to the brother of the girl who experiences most of the initial terror that they have come to the cabin to help his sister break her heroin addiction. She’ll say anything to get us to leave, they explain, just so she can get another fix. This explanation, combined with the potential hallucinatory effects of withdrawal, creates complete plausibility for both the ridiculous things the girl purports to have seen and the dismissive responses of her friends toward them. Then, there’s Ouija. This movie does not take place during one grueling night of horrors, as many do, but rather over an unspecified period of time, which may even be weeks, during which every single time the characters return to the house and interact with Debbie’s Ouija board and the spirits it allows them to feel and see, one of them dies. Their response? Parents and police never become involved and the group continues to return, inexplicably, as their numbers dwindle. This, combined with the fact that one of the most frightening jump scares in the entire film is caused by a shopping cart the audience is already aware of, was extremely difficult to get behind, let alone be scared by. Recalling Fuller’s explanation of the character’s position and goals, it definitely doesn’t seem like they’re going about their severing in the most efficacious way. I was fortunate enough to attend a screening of Ouija with a very interactive audience who laughed throughout most of the film. For example, when Laine drops a flashlight in a creepy attic while looking at creepy old pictures and creepy dolls and it rolls away from her (trope), the entire theater screamed “Leave it!” When Pete unveils an old article online that explains the murderous history of Debbie’s house (yay, another trope), someone behind me yelled “Oh yeah, I’m sure you were able to Google that,” and at one point the woman next to me started complaining to her boyfriend that this was getting ridiculous and they should all just burn the house down and go home. How the heck do you screw up a horror movie with a ouija board as the main conjuring device? The possibilities are frigging endless.